VNC – VNC is more of a protocol than an actual program. I am most familiar with UltraVNC which has done everything I have asked of it. Addressing a single complaint interacting with Office 2007 remotely has been the only issue, but has since been resolved. 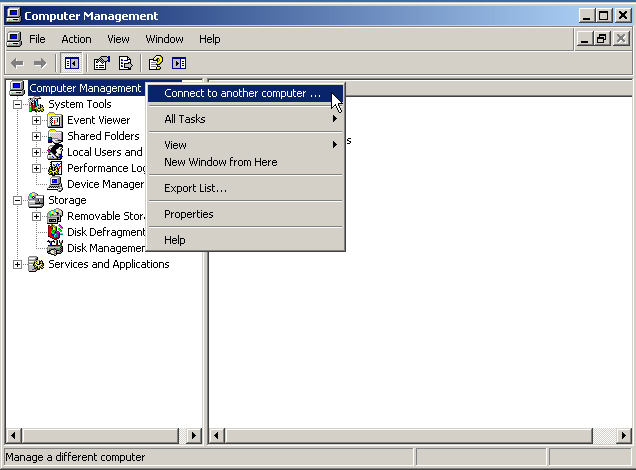 Windows Management Console – The Windows Management Console allows you to control a vast amount of settings and read a lot of information, but you can also use it across the network. Right-click on My Computer, and go to Manage… The screenshot below shows you how to make this display the information for a remote computer. You can view event logs, local admins or local users, device manager (read-only), disk management, and services. 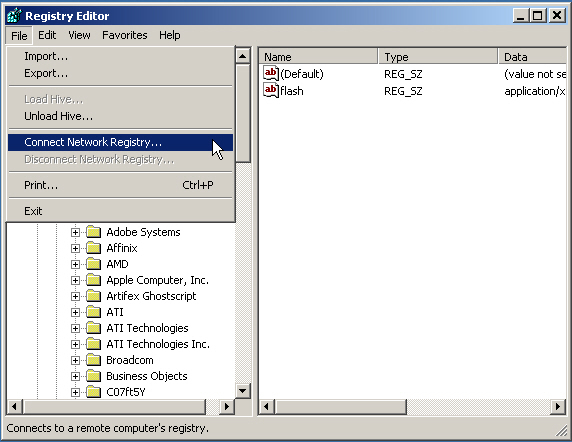 RegEdit – The Registry holds a lot of important information and sometimes you just need to update a key in the registry for remote computers with a new serial number or a disable value. You can access the HKey Local Machine and HKey Users hives across the network. HKLM holds a majority of frequently accessed keys, but a lot of important values are also held in the HKey Current User hive, so this might not always do the trick, but it can allow for a faster response some of the time. Go to Start, Run… and enter: regedit. The screenshot below shows how to make it work across the network. PS Tools/BeyondExecv2 – I’ve already explained the concept of these tools in previous posts (follow the links), but these allow you to run command line commands across the network. Whether it’s being used to see who is logged into a machine or install software, it’s a convenience to keep these tools handy. Hidden system shares – You can access a machine’s hard drive with the following address: \machineNamec$ The $ indicates it is a hidden share, which keeps it from being listed on the network or having that hand under the drive for the local machine. You can copy files to and from easily. SSH/Putty – SSH is a protocol to secure and tunnel traffic. Putty is one free client that makes use of this protocol. A simple, stand-alone executable, Putty is easy to use and is also an xterm emulator to make interacting with remote Linux machines ridiculously easy. Wake-On-LAN – You might investigate the Wake-On-LAN concept further if you’d like to be able to turn your machine on remotely so that you might use one of the above tools whenever you need to, regardless if the machine is on or not. WOL uses a standard that most modern NIC cards understand and a minimal amount of electricity. There are plenty of tools out there, so just do a search have your pick of the litter to find something that might work for you.